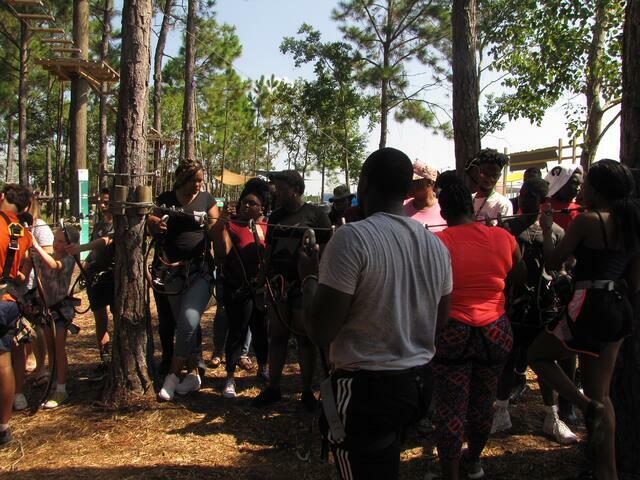 Recently, Student Support Services on Hinds Community College's Utica Campus had the opportunity to experience the Zip‘N Fun Park in Gulfport as part another meaningful cultural experience. This trip afforded our students the opportunity to engage in a challenging activity while supporting each other — something that is not always afforded to our students. Each activity required them to rely on each other to accomplish a goal and/or obstacle before moving on to the next challenge. Cultural enrichment experiences not only allow one to experience another’s culture, but is found in a variety of activities that provide exposure experiences that give one a new-found appreciation for another’s culture while simultaneously promoting diversity and lifelong learning skills. In other words, cultural enrichment can be fun so long as it teaches a core value. This trip taught our students how to work together as a team and how to encourage each other when it was clear that the activity was overwhelming and no longer “fun.” The core values of virtue and character are constantly evolving as our students learn and grow. They will never forget this cultural experience! 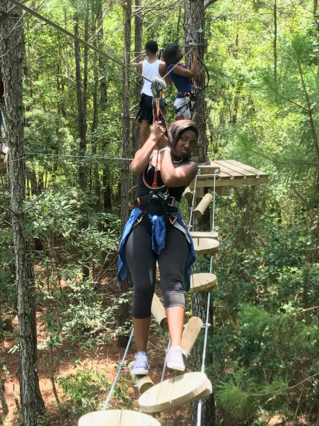 A few months ago, 27 students traveled to Gulfport to take part in team-building activities that included zip lining and treetop obstacle courses. When students learned of the opportunity, the immediate response from over half of them was, “NO WAY! 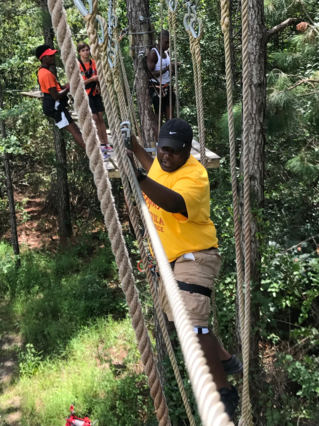 I’m afraid of heights.” I expected that so I used their responses as a teachable moment and discussed why we were indulging in such a challenging activity. While riding to our destination from the Utica Campus, the conversations lingered in the direction of being terrified of swinging in air with little or no talk at all about the obstacle courses. They were ready for them…so they thought. I chose this activity because I knew it would push students out of their comfort zone, while providing a meaningful fun cultural enrichment experience. It was my desire to encourage them to try new things, confront fears and to teach another core value, which is courage and a valuable lesson: “EVERYTHING IN LIFE WON’T BE EASY, but perseverance is definitely needed.” They must learn to stay the course and not give up. I encouraged the students daily that it’s okay to give in a little but they can never give up. 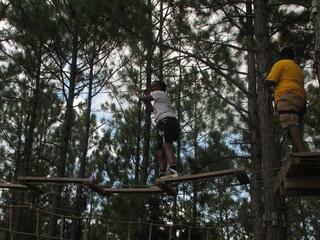 Zip’n Fun was a very challenging experience for all of us…more challenging than we imagined! 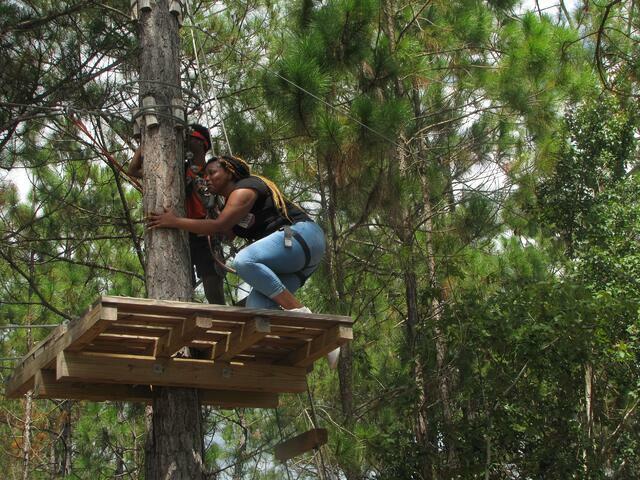 We were there for a few hours before the rain forced us to leave but not before we tackled the treetop obstacle courses! 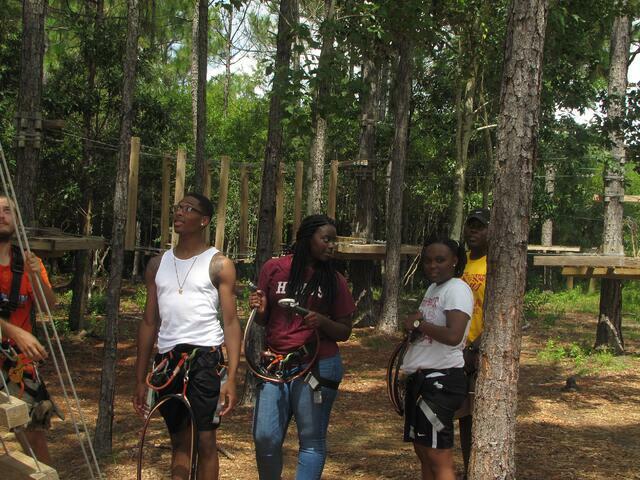 They were more challenging than zip lining. During the training session and prior to beginning the obstacle course(s), the team effort and camaraderie among them was awesome! We were all very excited! 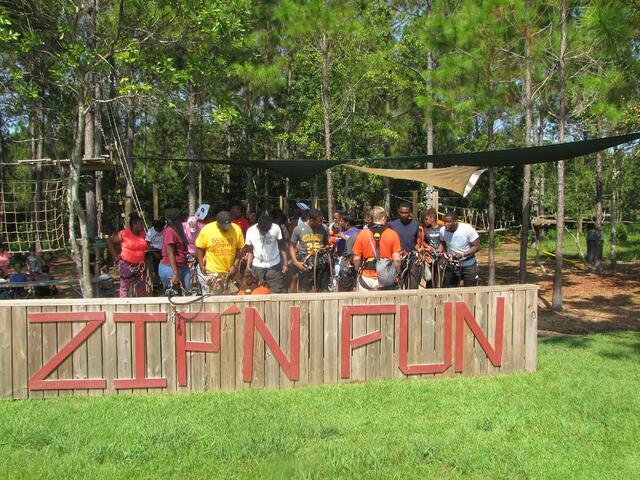 As the staff of Zip’n Fun gave instructions on how to use the harness provided, some of the students were struggling to attach it to the line. This was especially meaningful because from beginning to end, this particular experience required students to listen, follow instructions and work together to complete the challenge. As I reflected on the experience through the cultural enrichment evaluations from the students, I was so pleased to see that my goal to expose them to building teamwork skills had indeed been accomplished. Throughout the evaluations, students expressed how intense the activities were and even scary at times but even though they wanted to quit, the encouragement from their classmates made them try harder. Applying these same sentiments should be a daily practice. In life, we want to encourage our students not to be complacent; rather, we want them to be open to try new things without hesitation. Whether it be seeking an internship, speaking on a program, or taking more leadership opportunities, it does not matter… just try! There is a world of opportunity out there and SSS is laying the foundation that will teach them how to embrace change and challenges because to think otherwise, only inhibits them from being the best they can be. While providing services to assist and encourage our SSS participants to strive for excellence in an effort to matriculate to a 4-year college and/or career, I believe the incredible responsibility we have to impact the footprints of students’ lives by mentoring and guiding them along their journey is most rewarding. Despite the various titles within our SSS program, we are all advisers. With that being said, we must fully embrace the level of responsibility we have in nurturing our students. Reflecting on my own experiences, as a young, single mother entering my sophomore year of college---miles away from home, I was very nervous and unsure of how I would be successful. But I was fortunate to have a great support system which included my mother, extended family, friends, and advisers. In regards to my academic success, my advisers were most influential. The need for quality interactions with students will forever be prevalent. Student Support Services actively engages in fostering success. Therefore, in an effort to let our participants know their hard work is being noticed, we identified students of our program who received a 2.5-4.0 GPA during the 2017 Spring and Summer semester to take part in this cultural experience. Tara Johnson is director of Student Support Services on the Utica Campus of Hinds Community College.